Before moving onto the carrots that came in the veg box last week, I wanted to use those I already had in my flat. So I made two carrot dishes over the weekend. This spiced carrot dip was one of them. 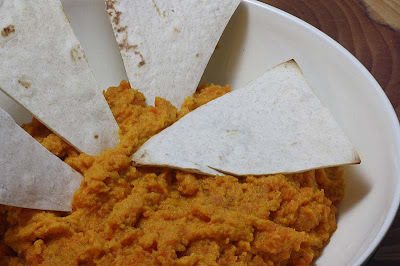 To make an occasion of them, I served this vibrant orange dip with some tortilla chips that I cut into triangles with my pizza cutter, then placed on a baking sheet that was coated lightly with olive oil and baked them for a few minutes until crisp. It was a lovely change from the chickpea hummus. The spices are quite mild, but you can taste them. Making this carrot dip, also gave me an excuse to bring out my carrot loving rabbit for aesthetic reasons you see, not so much the cute factor. Place the carrots in a large saucepan, cover with water and bring to the boil and simmer for 20-25 minutes until the carrots are very soft. Drain and set aside to cool. When cool either mash them or put them into a food processor along with all the ingredients and blend to a puree, but not too smooth, its good to have a little texture. Season to taste and serve with pitta bread chips or tortilla chips. Adapted from The Allotment Gardeners Cookbook. 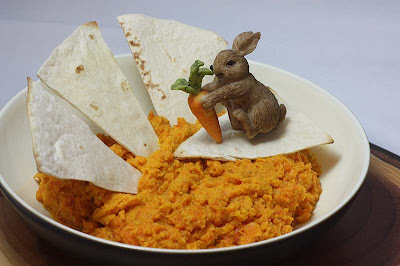 What an interesting recipe...I wouldn't have thought to make a dip out of carrots, but I'm sure this is delicious...love the bunny too! Thank you so much Fay. spiced carrot dip looks tempting!! i wouldn't mind for having it now...cute little bunny.. This is a very interesting and new to me dip. I like it because its different. Lovely! Im always looking for vegan dips and this one looks great. I would never have thought to make a dip with carrots, it sounds lovely. Living in the U.K I'm not familiar with Carrottop. Please can you or any other reader enlighten me? I really recommend this dio, its really warming. I've also come across a dip made with beetroot. It may be the next one I make with those beetroots I have in the veg box. This looks delicious. I am going to make the recipe for our camping trip to the beach next month. Yum! I hope everyone enjoys it, especially you. It really is a good one. I'm so excited about the idea of carrot hummus! Sounds so wonderful! That sounds and looks sublime! I like my blog header too. Still feeling uncertain about the name, especially as I no longer have an allotment plot. But i can't seem to 'give it up' as it is so much part of my blog identity too. MMMMMMM,...what a tasty carrot dip!! A must try! I really encourage you to try this dip. It really is a delicious one. Carrot dip! So glad i found you mangocheeks!! Great idea! Thanking you so much for becoming a follower.